Best Views of Clearwater Beach!! Location, Location, Location!!!! BEST VIEWS OF CLEARWATER BEACH!!! My most popular rental! Beach Side Suite is truly one-of-a-kind, 15 seconds to the beach. Just read our reviews! You won’t believe your eyes when you walk into this beach side slice of heaven. You won’t find a one bedroom studio closer to the beach with direct beach views on Clearwater Beach. BeachSide Suite is steps to the beach as well as walking distance to a Clearwater Beach attractions including restaurants, shops, bars and fabulous Pier 60. Take the Trolly or Water Taxi to The Clearwater Aquarium, Downtown Dunedin and Tarpon Springs. PRIVATE off street parking, a necessity on the beach. Imagine sitting on your patio each morning enjoying your morning coffee, just relaxing and enjoying your view while listening to the seagulls. A tropical landscaped bistro courtyard for grilling and chilling awaits you. 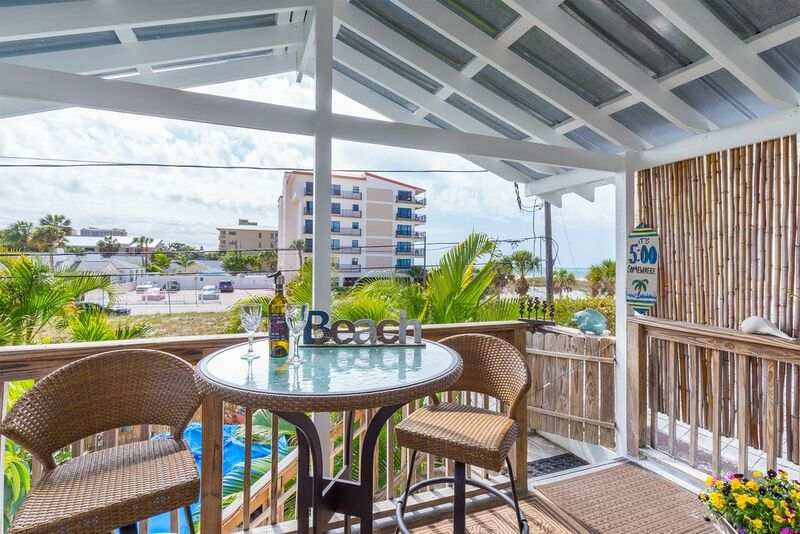 Enjoy your evening meals in the courtyard or on your private balcony overlooking the beach! Grab your beach towels, beach chairs and umbrella (all included) and head to the Beach voted #1 by Trip Advisor two years in a row!! After a day of enjoying the beauty and natural resources of our island, BeachSide Suite welcomes you back. It is designed for you to relax and unwind in comfort until your next foray of choice. BeachSide Suite features a comfy king size bed, full bathroom with walk in shower. Sit back and Enjoy your favorite movie or sports team on a 55’ smart TV. Your kitchen is supplied with dishes, pots and pans and all the essentials you will need. Complimentary guest washer and dryer. Clearwater Beach will slow your life down and when you leave our beautiful beach, you will be thinking of the next time you will be back. BeachSide Suite is for maximum two people occupancy, strictly enforced. This is a couples or solo traveler accommodation only. Floridian born and raised. Retired but I keep busy with my rentals. The sunsets are most beautiful. It appears to be different each night, colors seem to change all the time. I'm always looking for that mysterious, elusive green flash that sometimes is seen during the last seconds as the sun sets on the horizon. Don't blink!! Owner and property manager were very prompt in dealing with a small problem. The unit is literally a one minute walk to the beach (which was free). Sandy beach. Within walking distance of many dining choices. This rental is beautifully decorated with a well stocked kitchen and comfortable king sized bed. There were plenty of bath towels for two people, and beach towels and chairs were provided. More than the typical arrival paper products were available for guests. The entrance deck is a nice place to relax with comfortable seating. The palm trees obscure the beach view somewhat, but add to the beach vibe. We were able to walk down to the central beach and restaurant area, and catch the seafood festival. The only drawback we found for this property is that the washer/dryer are located underneath the studio, and directly against the second rental property, and guests are asked to do laundry only between 10 -7 due to noise. Since we were away during those hours, and I needed to launder a few items, I am guilty of breaking that rule. I would definitely stay here again. We love relaxing on the upstairs deck it has just enough of a view of the gulf that you feel connected to the beach. Everything in town is walkable from the unit yet far enough that it is quiet and comfortable. It's the perfect size for two people with all the conveniences of home. The place was great! Very clean and cozy. You can walk out the door and onto the beach, a short walk to restaurants, bars and shops. The beach is not very crowded in this area and perfect for enjoying the day at the beach. You are provided with beach chairs, a beach umbrella, and towels. You really are provided with everything you need to fully enjoy the beach; we loved that we didn’t have to worry about bringing anything ourselves. We had every amenity we needed and thoroughly enjoyed our stay. Would highly recommend! We really enjoyed our stay. We had everything we needed right there. Including the beach! This little slice of heaven is always delightful. We have stayed in this unit three times, and it is better every time! The owners are wonderful and always stop by to say Hello. Highly recommend! March/April and June/July are Saturday to Saturday rentals.